Vegetables (onions, celery, carrots), maltodextrin, sugar, yeast extract, onion powder, salt, potassium chloride, corn oil, carrot powder, water, modified tapioca starch, carrot juice concentrate, tomato paste, garlic powder, natural flavor, disodium guanylate, disodium inosinate, citric acid, extractives of paprika. Easily achieve a rich mirepoix flavor with Knorr Ultimate Low-Sodium Vegetable Base. Made from onions, carrots, and celery, this gluten-free broth base offers a time-saving and cost-efficient means of developing flavor in soups, stocks, sauces, and more. It comes in a versatile, easy-to-use format that excels in a variety of applications--from preparing hearty stocks to giving pasta dishes a flavorful boost. 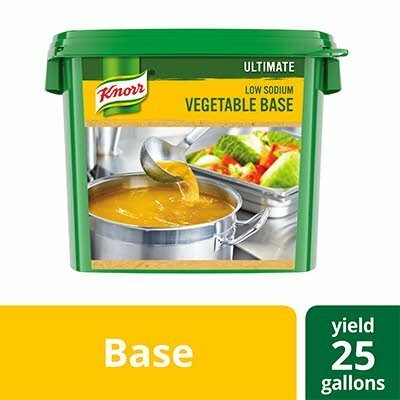 Designed with your kitchen and customers in mind, this vegetable soup concentrate is made with colors from natural sources and contains no added MSG or artificial flavors or preservatives. It is gluten-free, low in sodium, and vegan.